In this week's Food & Drink Mara Shalhoup reviews Scofflaw, a Logan Square cocktail destination that adds to the reigning triumvirate of Lula, Longman & Eagle, and the Whistler. 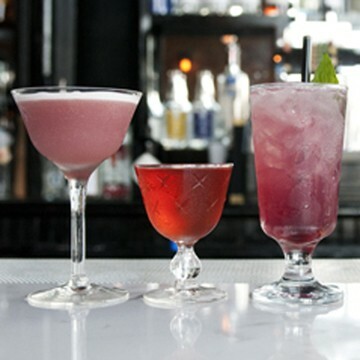 Head mixologist and co-owner Danny Shapiro’s gin-centric cocktail menu features seasonal concoctions like the Basil Bramble, a 100-degree-day antidote that combines North Shore #11 gin with lemon juice, Combier Mure, and fresh basil. All are $8, which is where chef Mickey Neeley's creative small plates top out (the one exception is his $12 off-menu guapichosa, an absurd—and absurdly good—sandwich layered with, among other things, brisket, pork belly, pork loin, pimenton aioli, avocado, and sriracha). If it’s still on the menu, don’t miss his blackberry-lavender sorbet with ginger granola. Julia Thiel ventures off the beaten track to the Point, a West Loop bar with a good-sized food menu that goes well beyond straight bar fare (spring rolls, heirloom tomato salad, ratatouille, a lobster po’boy) and puts upscale touches on the basics (truffled fries, short-rib nachos). The drinks menu is just as impressive, offering a dozen beers on tap (both whole and half pours) and another 20-odd in bottles and cans, plus a dozen wines by the glass, the same number of cocktails, and a good selection of spirits, particularly whiskey and tequila. In Cocktail Challenge, Manny Sofios of Gilt Bar and Au Cheval takes on natto, fermented soybeans with a uniquely slimy texture and arresting aroma. In his Culo Fizz he combines it with egg white, for froth, and roughly filtered Rock Sake Cloud, reasoning that “If you’re going to do something gnarly like this, you might as well fight fire with fire.” Next up is Nahm Kim of Sunda, challenged with shrimp paste.